Many people think they need to wash their hair more in the summer to combat the sticky heat. I recommend doing the opposite though. Rinse your hair daily, but only use shampoo once or twice a week. The summer heat dries out curly hair, and shampooing will add to this! Still condition daily to reduce frizz and create shiny, beautiful summer curls. Check out a recent blog post to learn more about conditioning your curly hair. The more you touch and play with your curls, the frizzier they will become. Avoid this problem on the hottest of days by trying an up-do. Try a simple ponytail to get your curls up and off of your neck! Another great idea is to wear a cute hat while out and about on a sunny day. This will protect your hair and scalp from the sun, and keep you cool. The higher the humidity, the more your curls will shrink up. Ladies with tight curls: Opt for a longer style for the summer. Longer hair means more weight, loosening and pulling down your curls. 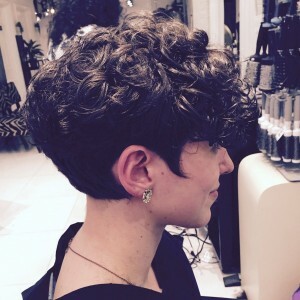 For those with wave-y curls, try a short, fun style for the summer! The s-formation of your curls will tighten up in the heat, creating ringlets with bounce. For your next summer cut, contact Leslie online or at 718-926-4050 today!